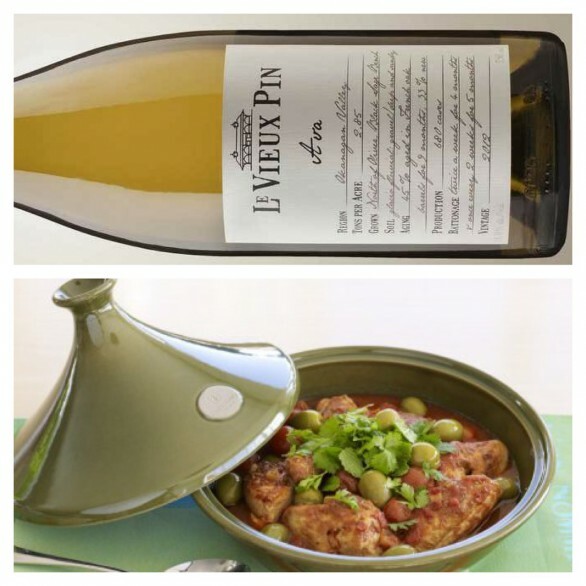 Food – Moroccan Chicken Tagine with Apricots and Almonds. Ava has body and weight. It is often overlooked at it’s ability to handle spice and chillies. I think this dish encapsulates Ava’s potential. Viognier’s classic stone fruit flavours will pair nicely with the apricots found in the dish. The wine’s weight shows elegance in it’s ability accompany the subtle nutty and spicy elements of the chicken. Recipe courtesy of The Daring Gourmet. Heat the oil in a large Dutch oven. Add the onion and saute until translucent, about 5 minutes. Add the garlic and ginger and saute for another 2 minutes. Add the chicken, turmeric, coriander, cumin, and cinnamon, stir to combine, and saute until the chicken is no longer pink. Add the water, bouillon cubes, chickpeas, harissa, honey, raisins, almonds, and lemon juice. Stir to combine. Bring it to a boil, reduce the heat to low, cover and simmer for 10 minutes. Add the butternut squash, stir to combine, return to a simmer, reduce the heat to low, cover and simmer for another 25 minutes, or until the squash is fork-tender. Garnish with some slivered almonds and serve with the couscous. Bring the water to a boil in a medium saucepan. Add the butter and bouillon cubes and stir until dissolved. While the water is still boiling, add the couscous. Turn off the heat, cover, and let stand for 10 minutes. Fluff with a fork and serve.